Learning what's worked from staff that have built a lot! Leadership is the key to implementation: if you're leading a paradigm shift you have to be okay with breaking some eggs to make the omelet. That started with Gabe Klein, the Director of the agency. Many of the staff said he was pushing to make the change happen, even if it didn't make sense in terms of the timing (e.g. thermoplastic in November). 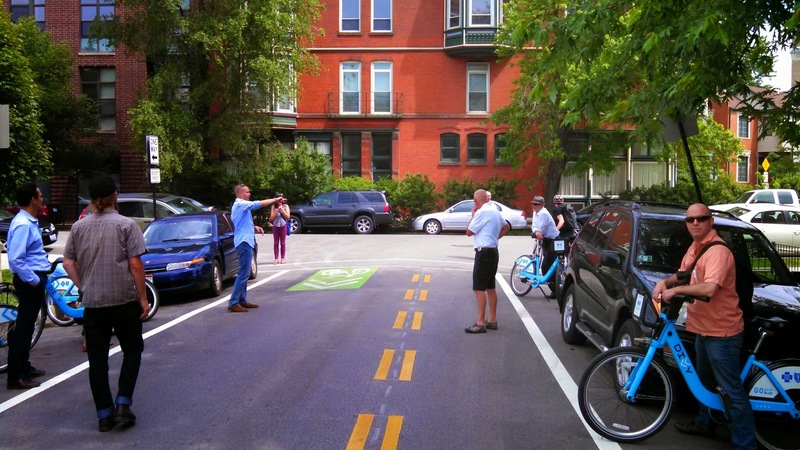 Traffic engineers are seen as a big hurdle: NACTO members view their engineers as one of the problems, not part of the solution. I heard this from many cities. The profession, perhaps through leadership in Institute of Transportation Engineers (ITE) has got to address this somehow. Chicago pavement is terrible: whether it be utility cuts, construction, or age, the pavement quality of Chicago makes Portland look good. Lots of great photos of potholes. I joked that potholes, may be a way to separate bike and vehicle travel. 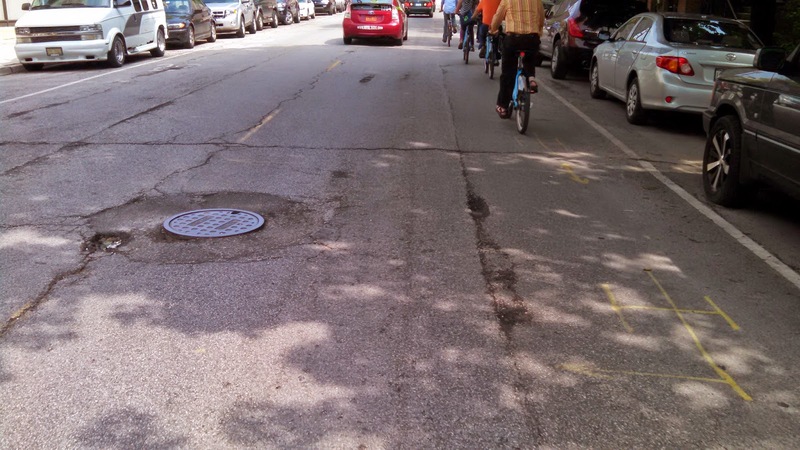 In honesty, it seems like something that needs to be a focus to improve cycling in Chicago. Staff from San Francisco indicate that their pavement crews are working closely with Active Transportation staff to identify where key bike routes need improvements. Potholes the size of moon craters in downtown CHI. Timing is everything: The end or the tour was very slow going because we stopped every two blocks. 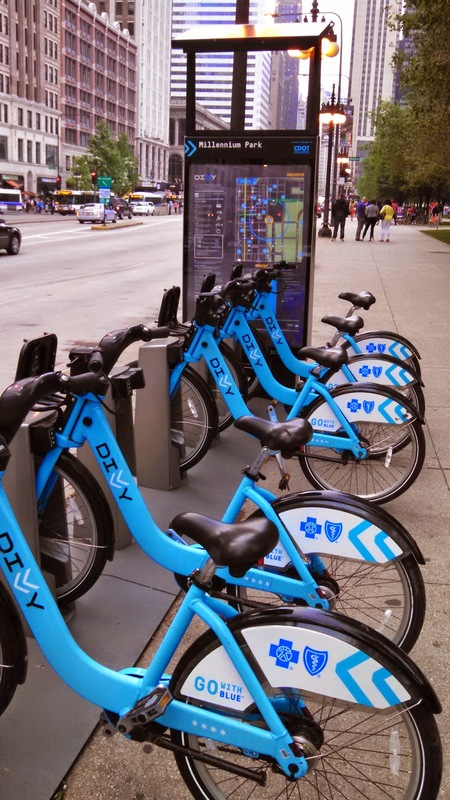 It was partly due to our large group, but also that the signals were progressed at speeds we couldn't make on our DIVVY bikes. 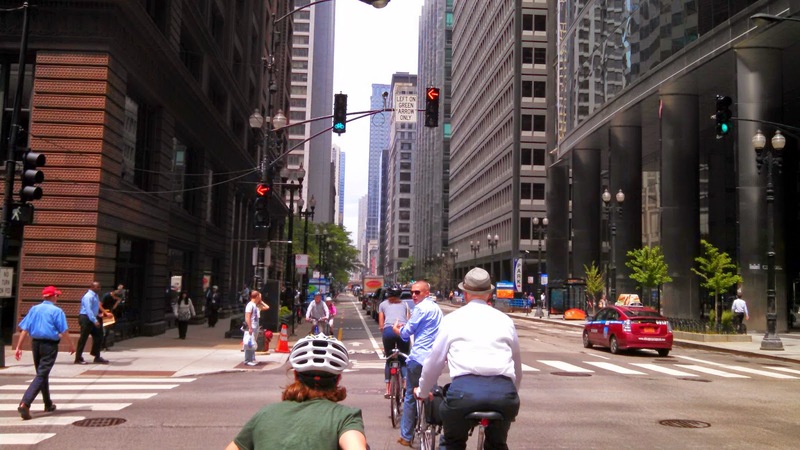 Downtown contraflow streets work well: The short cycle lengths serve Chicago well. If you get stopped, it's not for long. We were travelling with the direction of cars, I didn't have a chance to observe the reverse direction. Bike share is important to building mode share: There were a lot of people that didn't look like "cyclists" on bike share. 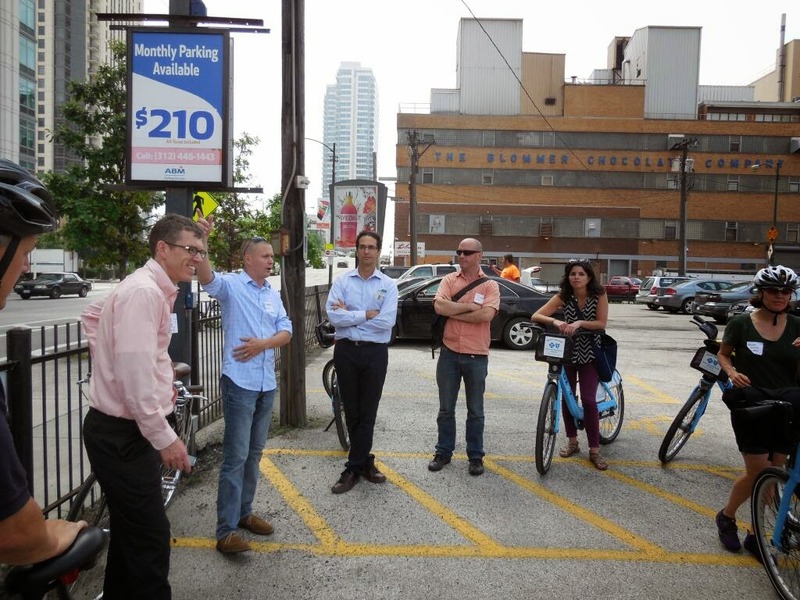 I first learned this in Montreal, where bike share is ubiquitous, it can be a game changer, but the stations have to provide sufficient coverage to make the system work and there's the challenge of placement of the stations that either may remove on-street parking or displace other uses. Protected lanes are the future for cities: The chaos of a downtown environment in a city as big as Chicago has to feature space for people on bikes. They don't have much in the way of 8 to 80 cyclists (we did see one older couple), but it's a possibility with what they have done in downtown. Part of that protection is bicycle signals and the turning movements that cross them. Chicago has featured a lot more protected lefts than New York City. would be done differently then shown here. Chicago is exploring treatments for neighborhoods to build links beyond all they have done in Downtown. The network Chicago is almost the reverse of what Portland created. The focus on Portland is largely in neighborhood greenways and bike lanes with little infrastructure in downtown. Chicago seems to have done the most in downtown and are now finding links that connect that portion of their network with the residential that is 3-4 miles out. One particular example was a contraflow bike lane in a residential area that made a nice connection.